FAMIUM Cloud-based 360° Video Playout: allows the viewing of high quality 360° videos with a reduced bitrade on devices with constrained capabilities such as TV sets. FAMIUM SAND: Is specified in ISO/IEC 23009-5 and defines standardized message formats for communication between server, client and network elements involved in the streaming process of MPEG-DASH. FAMIUM Multiscreen: provides technologies to connect multiple screens together so that applications can make use of and interact (present content) with multiple screens. E.g. implements the W3C webscreen API, UPnP and Dial service discovery. FAMIUM Multiscreen Advertisment: one-to-one targeted advertisement for traditional broadcasting. FAMIUM DASH: forms an end-to-end system comprising content composition, transcoding, segmentation, encryption, adaptive streaming and media playback at various endpoints. FAMIUM DRM: comprises tools for creation and playback of common encryption (CENC) based content incl. a Content Decryption Module (CDM) implementation for HTML5 based browsers. FAMIUM Personal Cloud: interconnects resources and APIs of multiple FAMIUM instances forming a private cloud of all your personal devices. 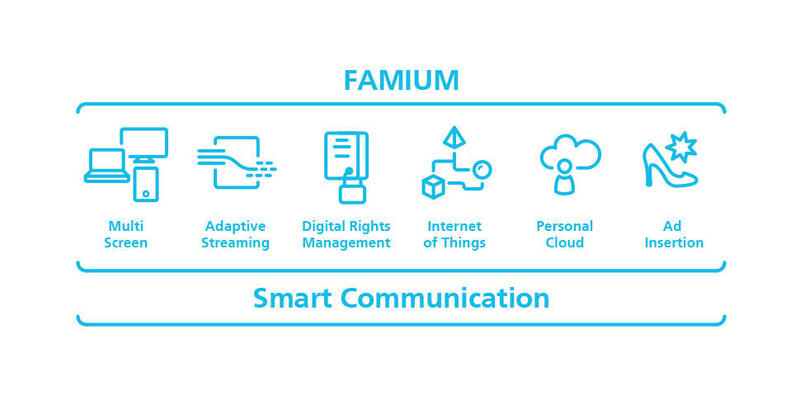 FAMIUM Internet of Things: connects TVs, cars, wearable computing devices, and all of the consumer and business tools to the Internet. FAMIUM TV Control Service: provides means to access TV sources, channels and their streams within your Web applications. To stay updated on the latest developments of FAMIUM Solutions and news of Fraunhofer FOKUS FAME, please subscribe to our newsletter. FAMIUM is an end-to-end prototype implementation for early technology evaluation and interoperability testing introduced by Fraunhofer FOKUS' Business Unit Future Applications and Media (FAME). FAMIUM supports a great variety of applications for mobile, desktop and connected TVs by facilitating multi-screen presentation, adaptive media streaming, content protection, cross-platform development and content synchronization. FAMIUM includes a Chromium build with extended features of latest and upcoming standards to allow early prototyping, experimentation, and testing of new functions and capabilities. These for example include, W3C Webscreen API, DIAL, Network service discovery, UPnP / DLNA, TunerControl API and many more. It is also a framework for the consumption and delivery of adaptive bitrate content as well as Digital Rights Management (DRM) protected content. FAMIUM bundles several Dynamic Adaptive Streaming over HTTP (DASH) and DRM related functionalities. FAMIUM's DRM solution is based on the W3C candidate recommendation Media Source Extensions (MSE) and the working draft Encrypted Media Extensions (EME).